Barton Deming was known as a leader in the real estate development field, and his extensive use of brochures and advertisements are examples of his innovation. There were at least two brochures published illustrating Euclid Golf properties, and we include copies of them here. Deming is also known to have used illustrated advertisements extensively. There are literally hundreds of advertisements that we have found in publications such as The Plain Dealer, The Cleveland Leader, and the prestigious Cleveland Town Topics. 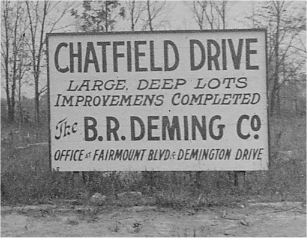 Not limiting his marketing to printed media, Deming also constructed many billboards throughout Euclid Golf, and actually placed customized billboards at the foot of each street. Deming also understood that buildings themselves could serve as advertisements. He erected two real estate offices, one located on Coventry at Fairmount, and the other located at the corner of Demington and Fairmount. His own house, located on Fairmount Boulevard near Cedar, was the first house visitors to Euclid Golf would see and was actually designed to be a "billboard" that would proclaim Euclid Golf as a highly desirable address for the well-to-do.